Photography daysacks often come with one huge problem; there’s nowhere to put your pac-a-mac, your lunch and, yes your tablet or other tech. The Reflexion from Case Logic tries to change that. 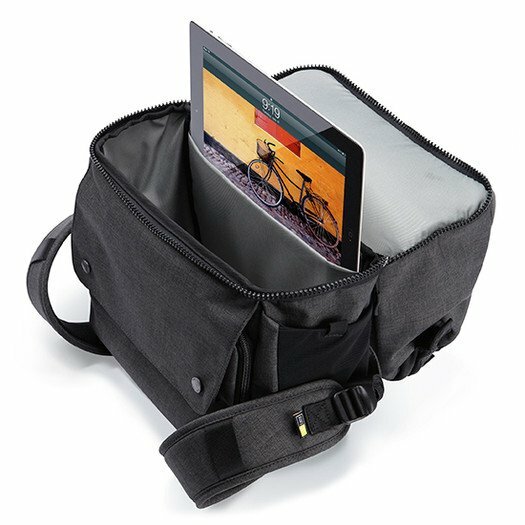 It’s designed for photographers packing a DSLR camera while adding compartment for a 10-inch, full-size iPad, though in doing so it leaves the top half of this grey fabric bag completely empty. The Reflexion splits in half to reveal its two separate storage zones. The iPad goes towards the back of the lower part of the bag (we also managed to just about squeeze-in a 11-inch Macbook Air laptop), leaving the rest of the bottom half to provide padded dividers to house a DSLR, a lens and perhaps a spare battery or two. However, those dividers can come out to create a tech bag that’s got nothing to do with cameras. Nice twist. The top section is for storing other things, such as a book, a Kindle, an umbrella or a pac-a-mac, but the best bit? A small stash pocket on the front that’s perfect for sliding a lens cap into while you’re out taking photos. Another highlight is a stretchy pocket on the outside that’s perfect for taking a leg from a tripod; a Velcro strap is provided further up to secure the tripod’s main bulk. It’s the icing on this well designed DSLR daysack.